Playing For Our Troops in Kuwait! This review originally appeared in South Shore Living, LI. Last summer Completely Unchained, a local Long Island band played at Tanner Park in Copiague as part of the Town of Babylon’s concert series. They never imagined that in 2018, they would have an incredible journey ahead, half way around the world to a nation once under attack by the Iraqis. 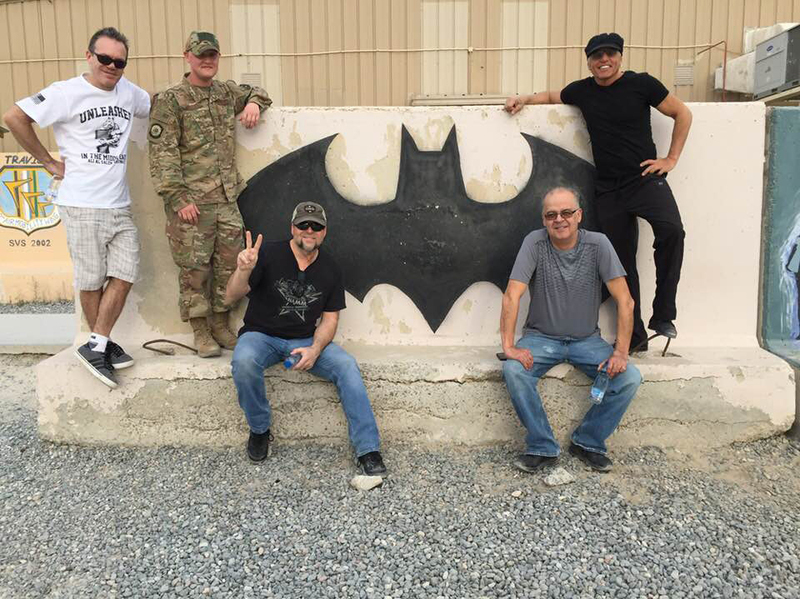 They were picked by the Base to perform for the troops stationed at Ali Al Salem Air Base. Their trip started out at JFK International Airport where they boarded Qatar Airlines. The staff was courteous, well trained and professional. They served food and drinks often and they were entertained with movies and games on the screen behind each seat. The flight lasted approximately 16 hours to a small country called Qatar, where they had to transfer on a flight to Kuwait. After about a 90 minute flight, they arrived in Kuwait. Security was tight. They had to apply for tourist visas to enter the country, which took almost 2 1/2 hours. Finally, after receiving their visas, they were able to gather their checked luggage and seek out transport to Ali Al Salem Air Base. They were met by two servicemen who would be their guides for the duration of the time on base. The van ride to the base was about 75 minutes long. The roads were desolate. They were now in the desert. In the middle of nowhere. Finally, they reached the base where they would spend the next few days. Their guides brought the band to the contained units which had 5 bunk beds and lockers for each of them. Air conditioning was provided but no toilet or sink. The restroom/shower units were just a walking distance along the gravel. Most of the base was gravel and sand. After settling in, they were brought to the cafeteria. They had some food before calling it a night. Sleep came at a minimum. “You can hear footsteps, vehicles, helicopters and airplanes throughout the night.” said Jake Miller, lead guitarist for the band. The next day, they missed breakfast, took showers along side the military members and made their way back to the cafeteria for lunch. Later they were given a small tour of the base. They saw many different housing tents and units, barracks, bunkers and the main base area where the recreation center was located along with a post office, general store, Subway, pizza place and coffee shop. They were to perform in the rec center so they proceeded to view that location. They were greeted by some Sergeants and Commanders who thanked them for making the trip to perform for them. They then head back to the cafeteria for a very good and well needed dinner along with hundreds of military personnel. “After a little rest, we spent the entire evening sorting out the PA system, cables, wires, amps and drums. Once the stage area was complete, we sound checked the system for the show the next evening.” said Miller. The next night, Valentines Day, Complelely Unchained played for about 100 people or so, as they all had different shifts and duties. Afterwards the band met with many of the personnel. They varied in age and rank. Some of them had been deployed in Syria, Iraq, Afghanistan, Kuwait and other countries in the region. “They all had some incredible stories. They were so appreciative for us making the trip and sharing our talents. We were very humbled to say the least. One of the Commanders even played the drums with us for one song. We definitely left a lasting impression on all who attended the show,” said Miller. It was time for them to leave the base and head back to the US for another weekend of shows in Florida. They had only a few hours to prepare for their departure. Another ride along the desolate road back to the airport. The flight leaving Kuwait was delayed due to a sick passenger, which led to the band’s missing their connecting flight to the states in Qatar. “The airline took full responsibility and arranged accommodations for them in a 4 star hotel in the city of Doha. The airline personal were all displeased about the situation, but the rest was well needed,” said Eugene Henriksen, lead vocalist. “The hotel was extremely nice, the rooms were impeccable and the bed felt like a cloud.” said Henriksen. They slept for about 5 hours. The downtime alllowed them to recharge their batteries for the long flight home. “We would now have to fly to Zurich and then transfer on to another aircraft for our final destination in Miami. We arrived totally exhausted and hungry, in need of a shower and a change of clothes,” said Miller. But they had no time for that. They had another show that same night which they would arrive late due to traffic leaving Miami. “Somehow, we were able to perform with what little energy we had left.” said Miller. The band made its way back to West Palm where they crashed! After finally having a decent night sleep, it was time for the band to prepare for one last show in Florida. So they packed up and head to Pompano Beach. “We felt refreshed and knew there would be a large audience as we had played this venue before. We enjoyed a delicious meal before hitting the stage. This time, we were at a completely different level. Our fans welcomed us with open arms and we felt right back at home. It was as if we never left the country.” said Miller. Overall, throughout the previous 6 days, the band was running on about 12 hours of actual sleep. Completely Unchained Gets Mention in VH Book!